From 2 November 2008 a new sculpture is on show in one of the largest museum sculpture gardens in Europe, the Kröller-Müller Museum at Otterlo, the Netherlands. 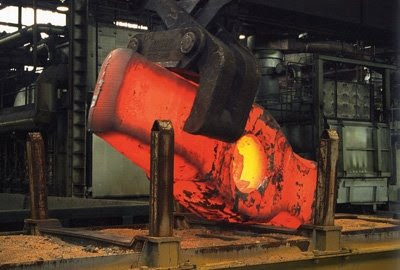 The acquisition of 'EuropaHammer' by the German artist Andreas Rimkus is part of Rimkus’ international project intended to keep the blacksmith’s art alive for future generations. It involves placing seven forged hammerheads in Africa, Asia, Australia, Europe, North and South America and Antarctica. The massive hammerhead measures 320 x 120 x 90 cm and weighs 12.8 tonnes. Ginkgo trees will be placed, one of which will serve as the handle for the hammer. The ginkgo has been chosen to reinforce the art work’s symbolism: it is a strong tree that will last for generations. As the tree grows it will fuse with the hammerhead. 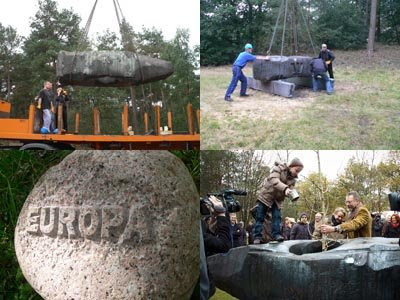 Update: Arrival and installation of the EuropaHammer and plant ceremony at the unveiling on November 1 2008.